With a combined 12-2 record in the Diablo Athletic League, Miramonte (4-0), Acalanes (5-0) and Campolindo (3-3) are all in position to qualify for the post season tournament, if they don't knock each other off. Two of Campolindo's losses have come at the hands of Acalanes and Miramonte by a combined five goals. 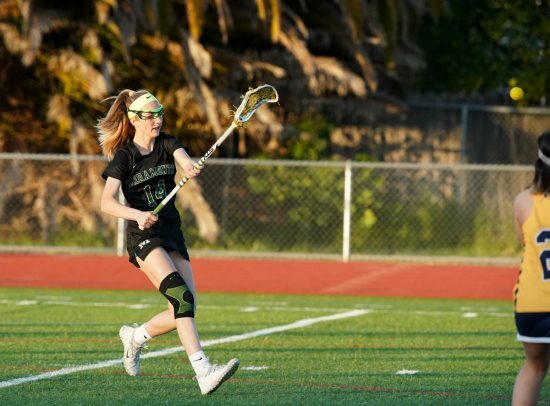 After winning the NCS championship, Miramonte head coach Jackie Pelletier knew the "burden" that comes with success: "Our success over the past few years has made us a target. We're coming after the D1 schools. We are hoping to move up to Division I eventually." Still Miramonte can't avoid making this something of a rebuilding year, having lost 10 players to graduation. With a 9-5 record and 4-0 in league play, the Matadors can feel good about their overall play, says Pelletier: "We've had to do a lot of work on the team's chemistry and had a lot of holes to fill but a lot of the younger kids have been stepping into leadership roles. We are a very fast and athletic team. You can teach the skills but you can't teach the athleticism." Having to replace 75 percent of the team's starters from last year, Miramonte did have one player return from last year that missed most of the season with a knee injury, all-American Boo DeWitt (42 goals). "Boo has made a great return from her injury. As one of our captains she has been a great leader," says Pelletier. "Teams are face guarding her which is providing opportunities for our other players. She has improved on her draws and defense and is always working on the next thing." It's not just DeWitt that is leading the offense, says Pelletier: "Emerson Bohlig (33 goals) and Shaune Lundstrom (30 goals) along with Boo are learning to play together and all are top notch players that are working hard." The defense is being led by sophomore goalie Mina Jenab. "Mina is extremely fast and quick in the net," says Pelletier. "She has a good first step. She has quick hands, can react fast and has a good reach. She is a great leader on the defense." Kiera O'toole is the backup to Jenab and has done a good job in learning from Jenab and pushing Jenab herself. In front of Jenab is senior co-captain and defender Vanessa Lam, who is seen as the quarterback of the defense. With the graduation of Maise Mills who is now playing at Claremont-McKenna, senior Kennedy Pearce and sophomores Libby Hawkins and Nicole Van Stralen have stepped up along with Mills' sisters, junior Grace and freshman Bridget. The team is still a work in progress, according to Pelletier: "We're still developing our chemistry. However, we're not a one-sided team. We have a lot of players that can score and set up each other. We have good depth and a lot of kids that can do it on both offense and defense." 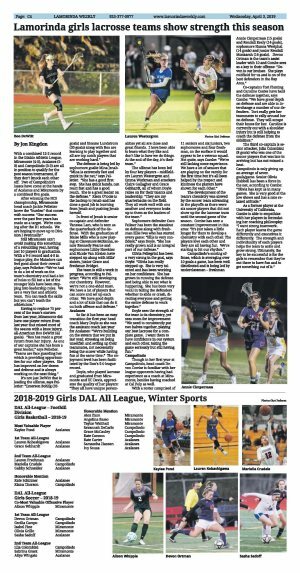 So far it has been an easy transition for first year head coach Mary Doyle as she was the assistant coach last year for Acalanes: "We're building on the system that we put in last year, stressing on being unselfish and setting up their teammates, not necessarily being the scorer while having fun at the same time." The enjoyment level has been facilitated by the Don's 5-0 league record. Doyle, who played lacrosse and graduated from Miramonte and UC Davis, appreciates the quality of her players: "They all have unique personalities yet all are close and great friends. I have been able to learn what they like and don't like in how we do things. At the end of the day, it's their team." The offense has been led by four key players - midfielders Lauren Westergren and Emma Workman and attackers Claire Gallagher and Grace Gebhardt, all of whom Doyle relies on for their talents and leadership: "They are my quarterbacks on the field. They all work well with one another and everyone looks up to them as the leaders of the team." 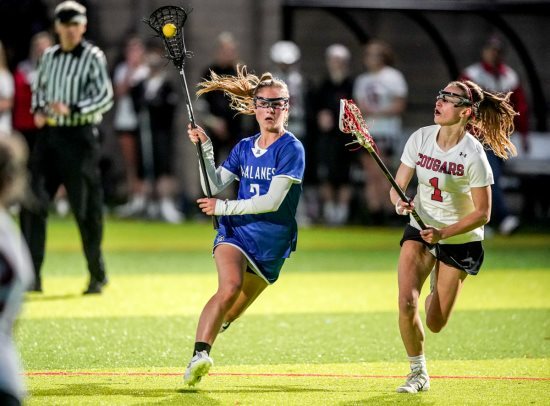 Sophomore defender Coco Fellner has been the standout on defense along with freshman Ellie Ives who has started every game: "Ellie is very confident," says Doyle. "She has really grown and is an integral part of our defense." Olivia Pellegrini has been a very strong in the goal, says Doyle: "Olivia has really stepped up. She is very talented and has been working on her confidence. She has grown in running the defense and being able to see what is happening. She has been very vocal in telling the defenders whether to slide or crash, directing everyone and getting the entire defense to work together." Doyle sees the strength of the team is its chemistry, yet sees room for improvement: "We need to consistently put two halves together, playing our best lacrosse for a complete game. I want them to have confidence in our system and each other, taking the game seriously but still having fun." Though in her first year at Campolindo, head coach Devon Combe is familiar with her league opponents having had experience as a coach at Miramonte, besides having coached at Cal Poly as well. With a roster comprised of 11 seniors and six juniors, two sophomores and four freshman, on the surface it would appear to be a veteran squad. Not quite, says Combe: "We're still lacking some experience. We have a lot of seniors that are playing on the varsity for the first time but it's all been helped by the respect and kindness the players have shown for each other." The development of the team's chemistry was slowed by the soccer team advancing in the playoffs as there were six soccer players that did not show up for the lacrosse team until the second game of the season. Combe has seen a constant improvement in this area: "It's just taken a little longer for them to develop a chemistry with each other. The players love each other and they are all having fun. We're starting to hit our rhythm." 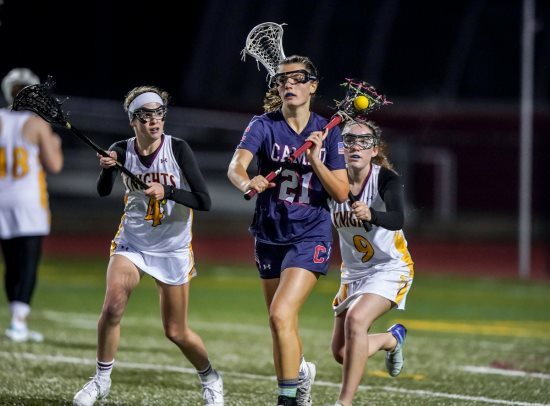 Campolindo's scoring offense, which is averaging over 10 goals a game, has been well distributed and is being led by underclassmen - freshman Annie Cimperman (15 goals) and Kendall Keely (14 goals), sophomore Hanna Westphal (14 goals) and junior Kendall Monkarsh (16 goals). Devon Ortman is the team's assist leader with 10 and Combe sees as a key to their offense: "Devon is our bruiser. She plays midfield for us and is on of the best defenders in the Bay Area." Co-captains Tori Fleming and Caroline Coates have held the defense together, says Combe: "We have great depth on defense and are able to interchange a number of our defenders. Tori really gets her teammates to rally around her on defense. They will scrape their knees for her. Caroline is currently out with a shoulder injury but is still helping to coach the defense from the sidelines." The third co-captain is senior attacker, Julia Colombini (8 goals) who was one of the soccer players that was late in arriving but has not missed a beat. Campolindo is only giving up an average of seven goals/game. Senior Olivia Hubbell has been a force in the net, according to Combe: "Olivia has kept us in many games. She is very good at the low shows and has a nice relaxed attitude." As a former player at the University of California, Combe is able to empathize with her players in formulating her coaching philosophy: "I want strong teamwork. Each player learns the game differently and executives it differently. The strength and individuality of each players helps the team to unite and grow strong. Ultimately, the key to be successful is for the girls to remember that they're out there to have fun and to get something out of it."